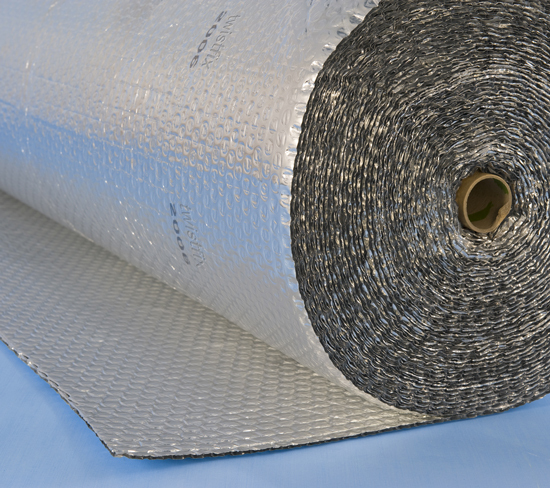 Insulation — Ecoflex is Green & Clean! Want to save money? Of course you do. Have a warm house in winter and a cool house in summer? Naturally. And be kind to the environment? Yes, definitely. You can do all three with Ecoflex, available from the Twistfix website. The product forms part of our warm roofing insulation section, which also features roof loft insulation spray and tanking membrane. Saving money and being kind to the environment are high on the list of priorities for the modern homeowner. The cost of energy, in both financial and environmental terms, continues in a steeply upward trend and has made everyone more careful with their budgets. Awareness of the damage caused to the environment by reckless energy use has simul­ta­ne­ously become more prominent in the public consci­ousness. Reducing expenses whilst reducing carbon emissions at the same time is a matter of paramount importance. Proper insulation goes a long way towards solving both of these problems. Heat-loss, particularly through roofs, is a major problem which results in higher energy bills and increased carbon output. Ensuring that this loss is minimised as far as is possible is vital; the importance of sound, properly-installed insulation cannot be unde­res­ti­mated. 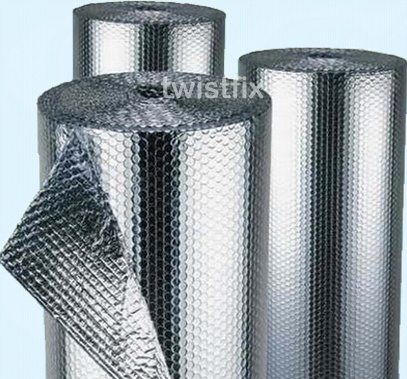 Twistfix provide a range of insulating solutions, one of the most popular being the Ecoflex Foil Insulation system. BRE (British Renewable Energy) approved, the innovative foil insulation is incredibly efficient at reducing radiative heat loss by utilising an infra-red reflective surface. Its versatile nature means it is suitable for a wide variety of applications including loft, floor, door, wall and radiator insulation. Easily and quickly applied, the product consists of two incredibly reflective layers of aluminium foil separated by an air film bubble centre. The low-emissivity air spaces greatly enhance thermal performance while the CFC/HCFC construction has an ozone depletion potential of zero. Ecoflex is available by the roll, each one measuring 25m in length and 1.25m in width for a total of 30m2. Easily cut with ordinary scissors before fitting to suit any size of area, each roll comes with free foil jointing tape as an added bonus. 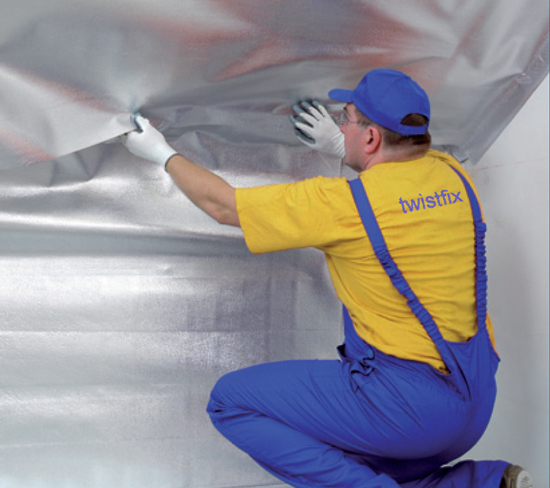 Assisting with the twin problems of high-energy costs and environmental damage is our speciality at Twistfix. Our damp proofing, weed and mould removal, crack stitching and waterproofing products are manufactured to exacting standards while our dedicated team has a wide range of expert knowledge. To begin saving money instantly with this highly-professional product,­ contact us today using one of our numerous options.